How does Christianity relate to contemporary Judaism? In this book a respected Jewish theologian learns a lesson from recent Christian theology: God's love of Christ and the church does not replace his love of Israel and the Jews. Ochs engages leading postliberal Christian thinkers George Lindbeck, Robert Jenson, Stanley Hauerwas, John Howard Yoder, Daniel Hardy, and David Ford, who argue this point in their work. He analyzes recent thinking in Christology and pneumatology and offers a detailed study of the movement of recent postliberal Christian theology in the US and UK. Ochs's realization that some Christian thinkers retain a place for the people of Israel opens up the possibility of new understanding and deepens the Jewish-Christian dialogue. Peter Ochs (PhD, Yale University) is the Edgar Bronfman Professor of Modern Judaic Studies at the University of Virginia in Charlottesville. He is the author, coauthor, or editor of numerous books, most recently Crisis, Call, and Leadership in the Abrahamic Traditions and The Return to Scripture in Judaism and Christianity. He also serves on the editorial council of Theology Today. Discerning a close correlation between postliberal Christian theology and nonsupersessionism, Ochs, a Jewish theologian, gratefully receives the gifts this strand of Christian theology has to offer. But then he offers a startling gift in return. Moving qualitatively beyond mere 'dialogue' with Christian theologians, Ochs enters deeply, sympathetically, and critically into the heart of postliberal Christian theology and profoundly assists Christian theology in its work of building up the body of Christ. Are we not astounded by that? One thing now becomes utterly clear: Christian theology, if it truly seeks and prays for 'another reformation' by which divisions among the churches and divisions among Jews and Christians are repaired, can no longer do without such gifts as this--and without giving them in return. Anyone wishing to discern the contours of a properly postliberal theological ethos in George Lindbeck, Robert Jenson, Stanley Hauerwas, John Howard Yoder, Dan Hardy, David Ford, or John Milbank could not find a more astute guide than Peter Ochs, whose exposition is as penetrating as his critique is incisive. Deftly employing the philosophical tools of Charles Sanders Peirce, Ochs's focus is the bugbear of 'supersession,' yet his clear goal is a mode of exposition and analysis freed from easy polarities. A meticulous reading delineates the contributions each author makes to an inclusive Jewish-Christian theology, and in so doing reveals what renders these thoughts properly Christian. Several Jewish thinkers have applauded the recent efforts of Christian theologians to overcome supersessionism--the notion that the Christian church has replaced the Jewish people in God's covenant with Israel as the people of God--without abandoning their own Christian theology. Indeed, the efforts of these Christian thinkers have contributed to the deepening of their theology. Peter Ochs is one of the most prominent of these Jewish thinkers, and in Another Reformation he articulates his applause with unprecedented theological insight and philosophical perspicacity. Another Reformation demonstrates why Jewish philosopher Peter Ochs has been a seminal thinker for Jews and Christians seeking reconciliation through fidelity to the divine Word. 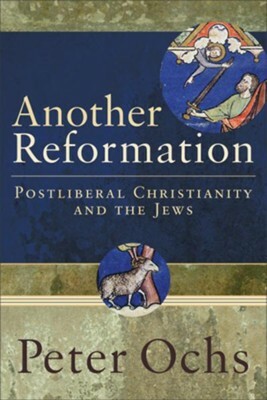 With profound insight, Ochs engages a set of Christian theologians committed both to classical Christian modes of apprehending reality and to the pragmatic exercise of critical reason, and discovers a correlation between their theological sensibilities and a nonsupersessionist orientation toward the Jewish people. In his own interaction with these Christian thinkers--via personal dialogue and written words--Ochs models the virtues he extols in those he studies: sensitivity to the particularities of historical and social context; reliance upon relational rather than dichotomous patterns of thought; an ecumenical concern to heal wounded communities; and an ear attentive not only to the voices of other human beings but also to the voice of God. This is a masterful example of the way Jewish scholars may contribute to Christian conversations, and a reminder that the Jewish and Christian conversations belong in the same room, where each circle can overhear and learn from the other. I'm the author/artist and I want to review Another Reformation: Postliberal Christianity and the Jews - eBook.